Just went through this. You need to pull the drive and the bellhousing. I used a 1/2" allen socket to undo the bellhousing. I did it when I had the bellhousings off but I am pretty sure it was doable with it all assembled. It would be a real b**ch and probably easier to take the drive off. Cheap gasket kit, 6 nuts and the hinge pins and you're in business. How hard is it to change the oil line that goes from the upper gear case to barb on the outer bell housing assembly? 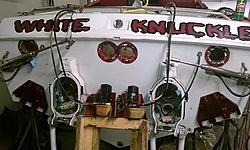 That hose goes to the top of the transom assembly and to the reservoir inside the boat. You would have to get around the exhaust and drive shaft bellows. I can't see it happening. In the pic you can barely see the hose on the top right inside. 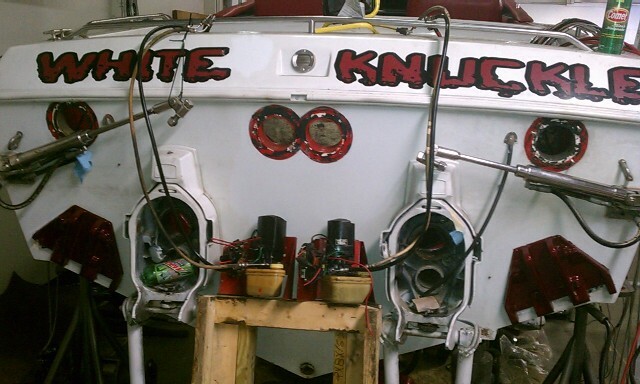 Never mind the mess I gutted my boat and redid it this season. Last edited by Rookie; 08-30-2011 at 10:14 PM. You would probably be time ahead by just removing the drive and bell housing, than the time and aggravation you'll have trying to work around things. It can be done, just a pain in the A$$!! !